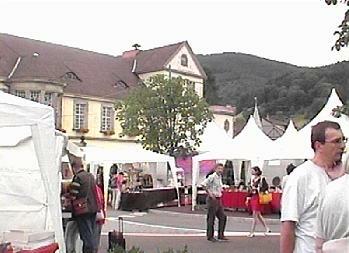 During the last week of June I attended the Sainte-Marie aux Mines show located in the beautiful Alsace-Lorraine region of northeastern France. 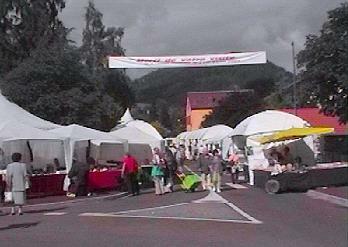 Sainte-Marie aux Mines is located about 45 km to the southwest of Strasbourg. This region is noted for its famous cheeses such as the munster variety and fabulous wines such as Champagnes, Reislings and Gewürztraminers. 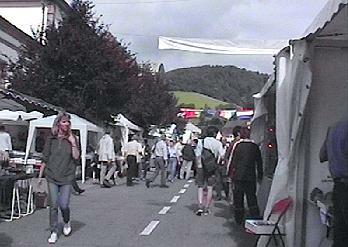 As the name of the village implies it is also a very old mining region with past lead and silver production. 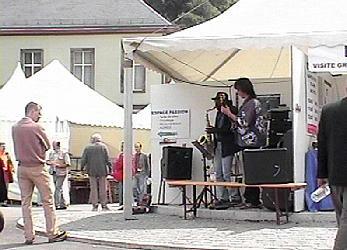 This show has been held for the past 37 years in this scenic and rural setting and is second only to the Munich Show as the largest show in Europe. 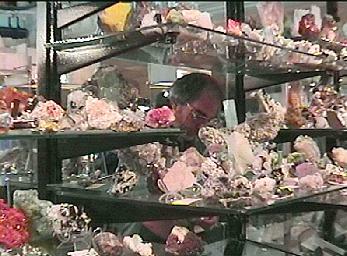 Not all are mineral dealers. 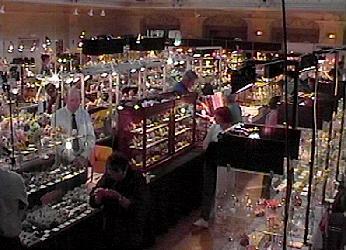 There are many fossil, gem and jewelry and carving/sphere (objet d'art) merchants at the show. As far as venues go the Ste.-Marie Show is quite appealing. 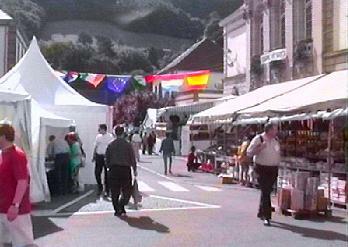 The town essentialy cordons off a section near the downtown area and fills the streets with tents and converts the use of several buildings - most noteably the Theatre - into selling areas. The outdoor tents lining the streets comprise the majority of the selling areas for the 540 international dealers which set up at the show. (An interesting note: there are virtually no dealers from the United States that set up at this show. I think I counted a half dozen or so in the show guide out of the 540 present.) The Theatre is the locale for the better known dealers with, generally speaking, higher quality and higher valued material. Another view of the upstairs section of the Theatre. To the right a customer views the available material. 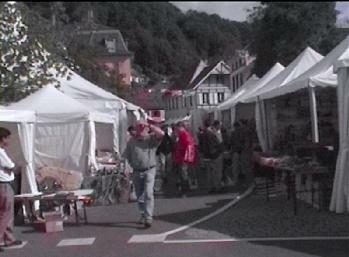 The Stage area in the background of the photo on the right also had dealers selling specimens. And, since the show is in France, it is only natural to assume that the food and beverages available to patrons would be of a high quality. In this there is no unmet expectation. The availability of various salades, cooked meats and sausages, beverages, etc is fantastic. There are several areas set aside to allow visitors to have a meal and conversation. In Europe, the time to have a meal is an important time to visit with people and discuss everything from A to Z. Stark contrast to the typical style in the US of jamming food down and moving on... "Food" for thought. The show is divided into two parts - the first two days being "dealer days" then the last three being opened to the general public. I arrived on the afternoon of the 20th and the weather was quite nice being mostly sunny and warm. Hardly anyone was set up and tents were still in the process of being put up. 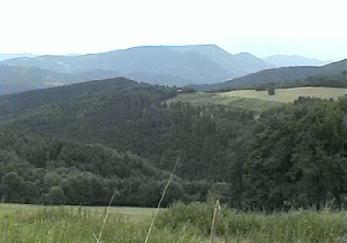 It was a great chance to visit more of the countryside and see the sites. Colleen and I decided on a short 5 km hike to visit several of the old abandoned mine areas. The Office de Tourisme has done a FANTASTIC job of providing information on the region with well marked trails and interpretive trail guides. We were able to read up on the history of the area and also learn more about the varied flora and fauna found in the Val d'Argent (Silver Valley) region. elevation is about ~1200 meters (~3600 feet) at the highest areas in this photo. Late in the afternoon I visited various Moroccan dealers who were actually set up there and found several nice specimens of azurite,fluorite,erythrite and anglesite. There was a very large amount of new vanadinite from the Milbladen area as well as azurite from Touissit. It took a fair amount of time to plow through all of the specimens available there so as to find the specimens free of the detracting damage. Unfortunately, the vast majority of the material is damaged through either poor handling or collecting methods. There were some fine specimens there - you just had to put the time in to find them. Everyone else was either not there yet or still unpacking their material. That evening Colleen and I dined at our accomodation in Lapoutroie (located about 20 km to the southeast of Ste. Marie. We stayed at the Hotel du Faude. I have to extend my sincere thanks to the Office de Tourisme that can be found through the Show Organizer's website. I entered in the criteria for the accomodations I wanted and they made a reservation for us. It was VERY simple and the place we stayed at was fantastic. Cheers to the Baldinger Family! 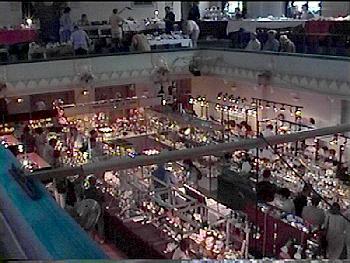 The next day (21st) was not really an official day for the show but about 50% of the dealers were open for business. I spent the entire day visiting everyone who was opened. It was fairly warm and a little muggy. A good day for an ice cold draft Kronenberg beer late in the afternoon. During the day I visited Ian Bruce from Crystal Classics and purchased several outstanding scorodites from the Hemerdon Ball mine in Sparkwell, Devon, England. I also visited Gilbert Gauthier who always has some excellent uranium based species. While at his booth a fellow from Canada came by toting a flat of carletonite specimens from a new find made in the last couple months at Mt. St. Hilaire. These were some of the best new material I have seen in years so I bagged a couple of them. Also on my seek and find list this day were specimens from the Tsumeb mine. I found a number of very good specimens that will be available later this summer on my new website - Tsumeb.com. Looking west up Rue Kroeber from near the center of the show Looking east the opposite direction toward the center of town. photo is the Theatre. Note the European flags draped across the road. View looking north up Rue vers La Parc. 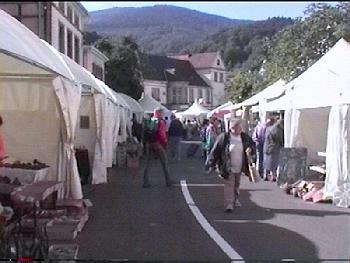 Looking north down the Cour Judo towards the Cour Velos. 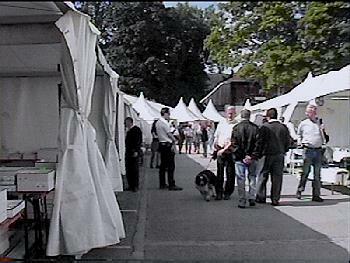 The presence of dogs at the show was quite common. Everything from small poodles to Saint Bernards. During the day I found a German dealer who had a very good array of fluorite from Okarusu, Namibia. Interestingly, he had a couple specimens of fluorite colored yellow and violet (rare from this locality) available. Also, an assortment of greens and blues which the locality is noted for. 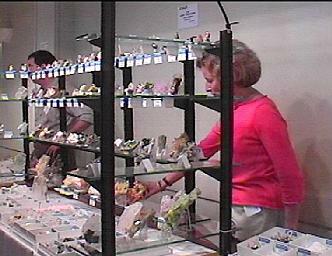 I noted that there were many dealers carrying the green Chinese Pyromorphite. I am not sure what the future supply of these will be as everyone was cryptic about their sources. All I can say for sure now is that there is a large amount of material available and there is every reason to expect that it will continue to be available for some time to come. On the 23rd I was at Ossala's tent just outside the Theatre when he was displaying some brand new roselites and purported wendwilsonites from Bou Azzer, Morocco. My mouth watered when I saw the brilliant luster and rich color. The wendwilsonites may in fact be roselite since the difference is primarily the higher ratio of magnesium to cobalt. I am having these specimens tested by x-ray and chemical analysis to verify their purported identification. I also found a large array of interesting Spanish material from various dealers including Jordi Fabre and Juan Rivera Pena. Jordi had some new blue quartz (quartz with aerinite inclusions, very rare violet colored fluorite from the Moscona Mine in Asturias, Spain. This mine has produced abundant yellow fluorite and this new find represents a first for violet color. Juan Rivera Pena also had some good specimens of Kornelite of which I picked up a couple. That night Colleen and I had supper with Jordi and his two assistants Jordi (we refered to him as Jordi - II) and Julia at a small hotel outside of Sainte-Croix aux Mines. It was a true Alsacion meal with Foie Gras, various cheeses, salads, and cooked meats from beef to duck. Jordi explained the value of mixing various foods and wines in the proper sequence to fully enjoy the mixture of flavors. He was right in every situation. The deserts were indescribable in the English language. 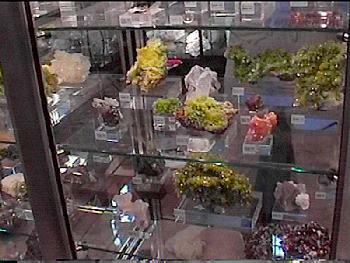 pyromoprhite as seen in one of displays in the Theatre. Also in the Theatre I came across a fellow by the name of Righi Umberto. He mines fluorite in the Les Causses area of France. He had two new finds of fluorite from the same mine - rich amber colored specimens similar to the amber fluorite from the Valzergues Mine in Averyon, France. His other was an interesting etched variety of bluish green and violet. Thanks Christine and Laurent!!! 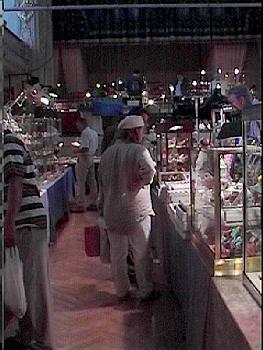 A picture of Righi behind his booth. 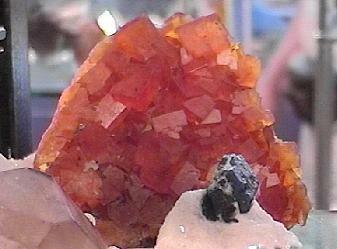 A specimen of the rich amber colored fluorite from Les Causses. Righi also had some of the world's finest known ferro-actinolite specimens found recently from Pakistan. 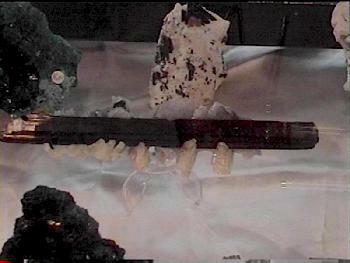 This crystal of ferro-actinolite is over 20cm in length andis doubly terminated. It was photographed at the show by Jeff Scovil. On Saturday I decided not to attend the show since it was raining. Instead, Colleen and I took a day and drove a small portion of the Rue de Vin visiting only a small percentage of numerous cellars along the route and sampling more of the fantastic foods of the region. It was an easy choice to skip the show that day. Afterall, the world is full of a lot more than just minerals. onlookers including me. 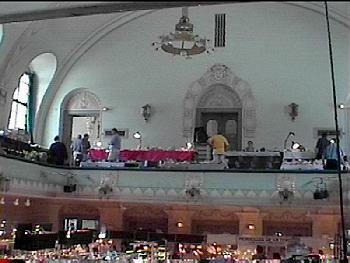 The photo on the right is looking at the Theatre from the center of the show. We were in the area for 6 days total and had a very memorable experience. I ran into several other friends from the United States while at the show including Sandor Fuss and Ken Roberts from The Collector's Edge, Jay Smith and her mom and dad from the Rock Smiths, Bill Larson and his family from Pala International, Scott Werschky from Global Mineral Resources, Gloria from Jeff & Gloria's Minerals, Ross Lilly from North Star Minerals, and Dan Weinrich. Colleen and I are already planning to come back again in 2001!